In general, a wedding dress is used only once and then stored in a closet to leave it there for years … creative movement “Trash the Dress” offers a session of video art and photography, by wearing the dress to get it wet and muddy. 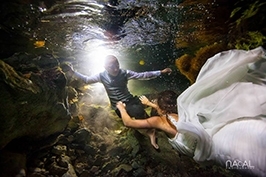 The photographer Mark Eric first suggested trash the Dress term in the U.S. in 2000, while others say that its origins date back to Las Vegas in 2001 linked to photographer John Michael Cooper. Tendency to destroy the wedding dress could be seen in Hollywood since at least October 1998 when Meg Cummings of the Sunset Beach show went into the ocean with her wedding dress on the day of her wedding. This artistic movement, mostly photographic, contrasts elegant clothing with stages totally unusual or non-standard such as an abandoned factory, a beach, a salt, a Cenote, a lake or the street. 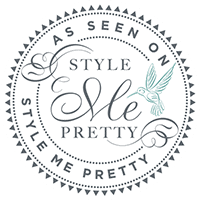 inspired by the adventurous spirit and aesthetic of the TTD, a style that has spread worldwide, especially in the United States and Europe. There will also be placed the offerings like rice, beans, corn and fruit, which the bride and groom then exchange for votes: the groom will give corn to the woman that symbolizes the beginning of life and livelihood of the family, and the cocoa seeds meaning wealth and care that will love and marriage, while the bride will give tortillas and cocoa powder. 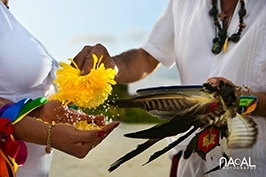 All people present at the ceremony will be involved in this activity making a circle around the couple, then throwing flowers, singing, reading poems and messages.There are now various ceremonies that can be performed by a Mayan shaman, among them we find the Mayan Wedding is a ceremony full of symbols. 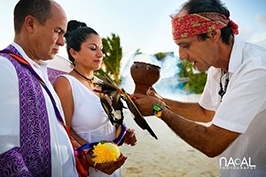 At an altar on the beach, place 4 jicaras, representing the 4 cardinal points. The jicaras are made of old containers of dried gourd shell, inside these containers, the Balche is served , a sacred drink made from tree bark and honey Melipona.